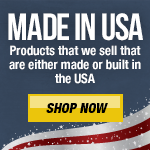 Discount Power Tools and Much More! POWERSTATE Brushless Motor: Purposely built for the M18 FUEL 16" Chainsaw to provide the power and performance of a gas engine up to 40CC. REDLITHIUM High Output HD12.0 Battery Pack: Provides 50% more power and runs 50% cooler versus standard REDLITHIUM HD packs. Superior pack construction provides the industry's best protection against jobsite conditions. 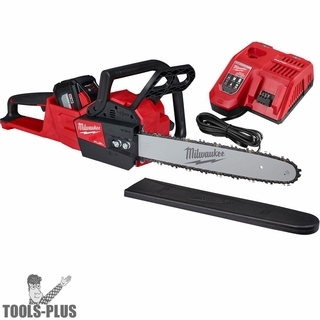 The Milwaukee 2727-21HD M18 FUEL 16" Chainsaw delivers the power to cut hardwoods, cuts faster than gas, and delivers up to 150 cuts per charge. The unit is designed to meet the performance, durability and ergonomic needs of professional landscape maintenance, power utility, and the installed M18 user. The POWERSTATE Brushless Motor maintains speed under heavy loads without bogging down to outperform small gas engines and higher voltage systems. REDLINK PLUS intelligence ensures maximum performance and protection from overload, overheating and over discharge. The M18 REDLITHIUM High Output HD12.0 battery delivers unmatched run-time in all applications. M18 FUEL technology allows the unit to reach full throttle in under 1 second providing ultimate control and productivity. The Milwaukee 48-11-1812 M18 REDLITHIUM HIGH OUTPUT HD 12.0 Battery Pack provides 50% more power and runs 50% cooler vs M18 REDLITHIUM HD battery packs. The massive increase in power elevates the performance of the entire M18system and drives the next breakthrough in M18 FUEL, delivering the power of 15A corded product. It delivers fade free power and runs substantially cooler through heavy applications, allowing tradesmen to push their cordless tools harder and longer than ever before. The M18 REDLITHIUM HIGH OUTPUT HD 12.0 is the best performing cold weather pack ever made, providing increased power in extreme cold weather conditions (below 0F / -18C). It provides the most work per charge of any professional power tool battery in the industry, driving full corded replacement on the jobsite. The RED LITHIUM HIGH OUTPUT HD 12.0 battery is fully compatible with 150+ M18solutions.The Milwaukee 48-59-1808 M18 & M12 Rapid Charger charges packs up to 40% faster, reducing downtime and maximizing productivity. The charger accepts all M18 and M12 batteries, providing an upgrade for both systems.Featuring REDLINK Intelligence, it communicates directly with the battery to monitor cell voltage, temperature, and charge status to optimize the performance and extend the life of the pack. As an added level of communication, the charger indicates when the battery reaches an 80% charge, providing confidence that a substantial amount of work can be completed without waiting for a full charge. Its got a quality feel with plenty of power to go with it. Works like a gas chainsaw. I like it a lot. Web Site Questions or Feedback? Because we get such good deals, we must reserve the right to limit quantities from time to time. 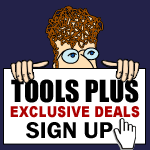 Tools-Plus is not responsible for typographical or photographical errors. Prices and specifications are subject to change without notice.